Elena Tovar received a Bachelor of Science in nutrition at Boston University, followed by a Master of Science in clinical nutrition at Rush University Medical Center. She is a registered dietitian in New York City. Tovar provides nutrition counseling/education to individuals and groups in a variety of settings. She has also helped to critically review journal articles for the ADA Evidence Analysis Library. Black, green and white tea all originate from the Camellia senensis plant. Their differences come from the methods by which they are processed. The flavonoids found in tea, specifically catechins and tannins, have strong antioxidant properties. There is mounting evidence that suggests that antioxidant-rich foods play a role in reducing the risk of cardiovascular disease. However, in the case of tea flavonoids, there is disagreement as to whether their major health benefits are related to antioxidant or other biological effects. The major difference between black tea and others is that it is fully oxidized. During the process of oxidation, catechins are converted into tannins, which are responsible for the color of black tea. 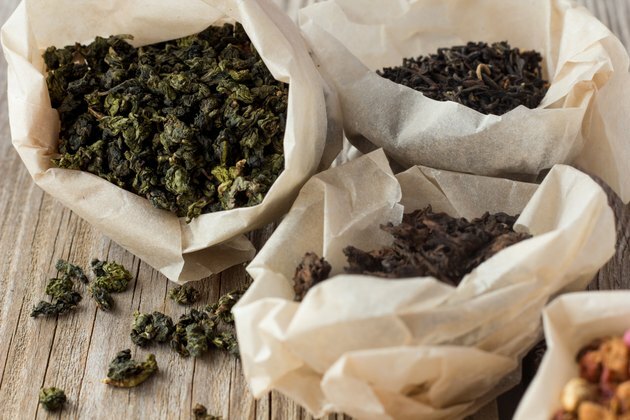 Although the antioxidant composition of black tea differs from other less oxidized varieties, total antioxidant content after the oxidation process is similar to what it was before. According to the Linus Pauling Institute’s Micronutrient Information Center, the available research suggests that consumption of at least three cups per day of black tea may decrease the risk of heart attack, while the consumption of at least four to five cups per day may promote blood vessel relaxation in those with coronary artery disease or high cholesterol. Green tea is made from mature tea leaves that undergo multiple stages of firing/steaming and drying but are not fermented or oxidized. Therefore, most of the antioxidants in green tea are catechins. One catechin in particular, epigallocatechin, can be found in high concentrations in green tea and has been singled out as the key contributive element to the possible health effects of green tea. In a large Japanese study conducted in 2006, when compared to those drinking less than one cup per day, daily consumption of five or more cups of green tea was correlated with a 16 percent reduction in all-cause mortality and a 26 percent reduction in mortality from cardiovascular diseases. White tea is made similarly to green tea; however, only the buds and young leaves of the tea plant are used. They are dried in natural sunlight and are not fired or steamed. This processing method translates to higher catechin levels than green and black tea but lower tannin levels. Few human studies have examined the health benefits of white tea related to antioxidant content. However, because the total antioxidant content of white tea is similar to that of green and black tea, it is possible that the cardiovascular benefits of white tea are comparable to those of green and black tea. Adding milk to tea does not inhibit the body's ability to utilize the antioxidants in brewed tea, as has been suggested. However, many factors, including tea brand, brewing time, age of tea leaves and soil content, do affect the antioxidant content of a cup of tea. Furthermore, it is difficult to determine how much the health benefits of tea flavonoids can be attributed solely to their antioxidant activity. Although it was once thought that the antioxidant activity of the tea flavonoids may also decrease the risk of many cancers and neurodegenerative diseases such as Alzheimer’s disease, scientists now believe that it is the ability of tea flavonoids to control gene expression that may prevent such diseases. Finally, tea flavonoids can bind with non-heme iron — the main form found in plants, dairy products and most nutritional supplements — and reduce its absorption. Therefore, it is best to drink tea well before or after a meal if you are concerned with iron absorption.